The New York Times bestselling “master of the modern thriller” (Boston Globe) returns with his most compelling hero — and his most electrifying tale yet. Lauren Heller and her husband, Roger, are out to dinner one night when they’re brutally attacked. Twenty-four hours later, Lauren awakes in the hospital to find that her husband has vanished without a trace. The only one who has any chance of finding him is his brother, Nick, a high-powered investigator with a private intelligence firm. Nick Heller is tough, smart, and stubborn. Trained in the Special Forces, he specializes in digging up secrets that powerful people would rather keep hidden. He and his brother have been estranged ever since the imprisonment of their notorious billionaire father. But Nick will do anything to protect Lauren and her son. He never backs down. Even if it means taking on the most lethal enemies he’s ever had to face. Plunged headlong into a desperate chase, Nick begins making shocking discoveries about his brother’s life — and about the giant defense contractor he works for. Now, in order to keep Lauren and her teenage son alive, Nick must take on a powerful and deadly conspiracy that will stop at nothing to protect its secrets. With breathtaking suspense and pulse-pounding action, right down to its final, astonishing twist, here is “the finest of the contemporary thriller novelists” (Pittsburgh Post-Gazette) at the top of his game. "Joseph Finder's new novel is a humdinger....a thriller to enjoy for its Washington locales, convincing familiarity with cutting-edge spy gadgetry, and taut action scenes." "Page-turning adventure and escapist fun. Finder’s strengths as a novelist, certainly on display in this latest narrative, are his profound understanding of espionage and his dead-on depictions of the cut-throat rivalries inside the landscape of corporate America." 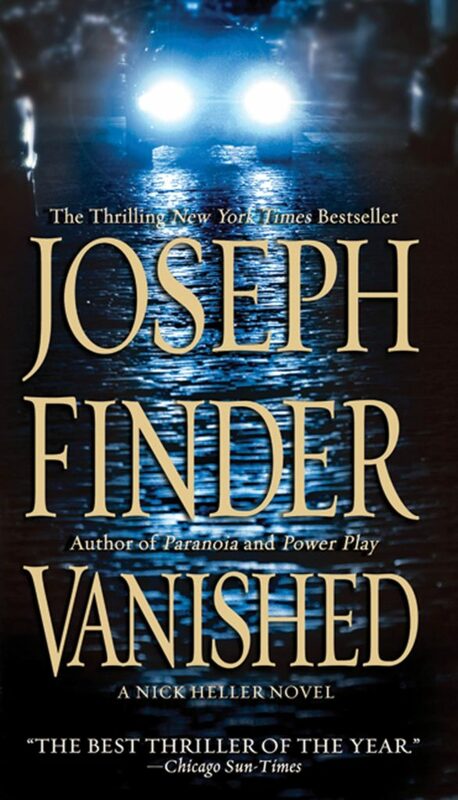 "VANISHED is not only the best thriller of the summer, it’s a strong candidate for the best of the year...It’s the thrills in VANISHED that will get your blood pumping, but it’s the emotions in it that will touch your heart." "Finder is that rare thriller author who actually writes well. He manages deft characterization, offhand one-liners and a fine sense of place....In the best thrillers everything is connected. Pay attention to the details here, because they all fit into the surprising and timely plot of this first-rate effort."